PDF files are most popular file format for official document exchange because We cannot edit the content of PDF file. But what if we want to edit a PDF file. In this case, we need a tool to convert PDF into an editable document format. There is so many PDF to DOC or PDF to Word converter tools are available. In this post, we will see HelloPDF.HelloPDF is a free PDF to Word converter that allows users to convert PDF files into a Word document. HelloPDF is easy to use tool that quickly converts a PDF file into and preserve all images and PDF layout. It has a simple interface. It is a standalone application and does not need any kind of software environment. Just select the source PDF file to convert into DOC file. Then select the location where you want to save the doc file. In case you do not want to convert all pages of PDF into doc, you can also select the start and end page number. After choosing your preferences, you can click on Convert to Word Document button. Although you will not get exact doc conversion the performance of the tool is really nice. Sometimes, it does not convert text background, but the layout and images are the same as in the original PDF. Converts .pdf to .doc file format. Options to preserve images, text-boxes, and shapes in pdf files. Open the converted file in default Doc Reader for further editing. Saves the converted file to a specified location on the system. The tool is really nice and you can quickly convert PDF into word documents. It is available for free and supports all available windows operating systems. The only thing you will miss that the tool converts the PDF into DOC format. You will not be able to convert into DOCX or other word file format. Still, the tool is worth to use. 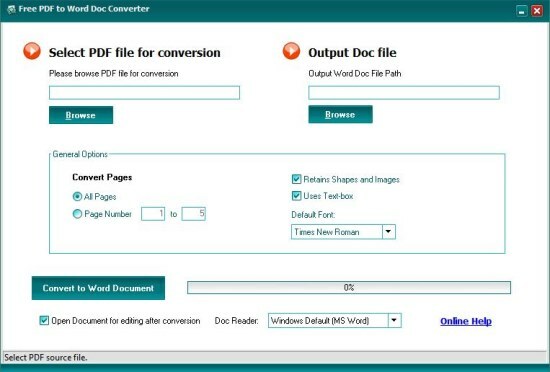 If you are looking for an easy to use PDF to DOC converter tool, HelloPDF is worth to use.